Spokane is in the beginning stages of updating their 20 year Comprehensive Plan. This guiding document sets the vision and path for the city as it tackles issues of land use, transportation, economic development, public health, capital project planning, and more. The Comprehensive Plan is the foundational document for developing new ordinances and policies to realize the vision it lays out. 3) A long form survey called “My Neighborhood Story” to provide in-depth information about the neighborhood and its character. This long survey takes 30-45 minutes, but you will be entered in a weekly prize drawing to win things like symphony tickets and gift baskets from local retailers. The information from these surveys and maps will be used by city staff to develop a profile for each neighborhood to be appended to the new version of the Comprehensive Plan. To see a draft neighborhood profile, click here. In addition to individual neighbor input, the city is asking each neighborhood council to provide input through these tools as well. The SNC Land Use Committee will work to draft a response to My Neighborhood Story that incorporates the goals and features of our existing open space and connectivity plans. We strongly encourage you to submit comments via the surveys. This is your chance to have your voice heard directly in the city planning process and extol the virtues of the Southgate Neighborhood. The bigger database of answers they have, the more reflective the new Comp Plan will be of our goals and desires. If you have any questions, you can contact shapingspokane@spokanecity.org. 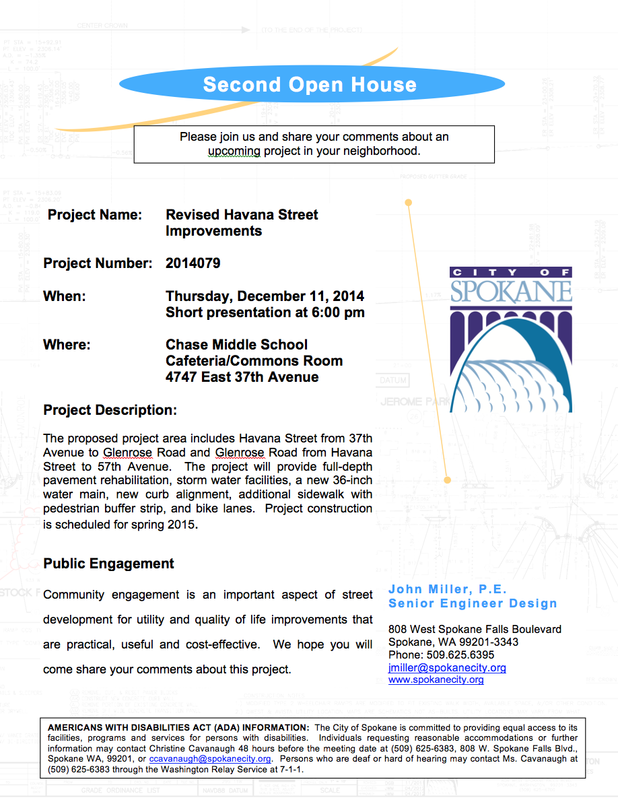 The City of Spokane Engineering Department will be holding another Open House on the Havana Street Water Main and Street Renewal Project. It will be Thursday, Dec. 11th at 6:00pm at Chase Middle School. Come see the latest design plans and ask questions. Click on the image below for more info! Trenching work for the water main begins Monday, Dec. 8th. If you have questions, contact Southgate Neighborhood Council or Julie Happy at the City of Spokane. Here is the agenda for the SNC monthly meeting next week at ESD 101. Here are the minutes from the September and November meetings for your review. At our monthly neighborhood council meeting on November 12th we received a presentation on the proposed 44th Avenue Water Main and Trail project. We were very happy to have about 70 neighbors show up to get information from the city engineering staff and discuss the proposed implementation of a portion of the Southgate Neighborhood Transportation and Connectivity Plan. The City has created a Blog Post to provide information on the project and get feedback from neighbors. SNC has created a project page as well to provide project updates and continue the conversation started yesterday. Thank you again to all who attended the meeting, I hope we will continue to get your input and comments as we work with the city. Please leave us comments here or on the project page. We look forward to seeing you at the next SNC meeting. Next year the east side of the Southgate Neighborhood is going to be the site of some pretty major road work. The city is going to be replacing a 36-inch water main in Havana Street from 37th Ave. to the water towers on Glenrose Rd. You can find the details on the city’s site here. The city is using their new integrated maintenance policy to repave the road and install continuous sidewalks from 37th Ave. to the city line. Other improvements will be bike lanes, storm water drainage improvements, and an experimental section of pervious pavement. At an initial meeting with city staff in July, SNC officers and members of the Land Use Committee suggested this project could be an opportunity to complete the bike/pedestrian connection along 44th Avenue outlined in the Southgate Neighborhood Connectivity Plan. The city said they would look into it, but that the current scope of the project was related to work along the Havana Street right-of-way. A couple of weeks ago, the city contacted the Southgate Neighborhood Council to say the newest design for the Havana project included the completion of a 12-foot multi-use trail between Havana Street and Freya Street…because the city needs to put in a 12-inch water main between Freya Street and Myrtle Street so the neighborhoods to the north of 44th don’t lose their water service during the construction on Havana. A notification letter was sent to property owners along the west side of 44th Avenue (from Freya to Julia Ct.) outlining some of the initial work to be done this fall. The development of this trail will continue the completion of a much needed east/west connection in our neighborhood (outlined in our neighborhood Connectivity Plan), allowing residents east of Freya to more safely and easily access the businesses along Regal Street and the developing Southgate District Center. A representative from the city’s Engineering Department will be attending our neighborhood meeting on November 12th to discuss the immediate steps to install part of the 12-inch water main before the ground freezes this fall. I encourage you to look over the plans the city has shared for Havana Street and come hear about the plans to create another bike/ped connection outlined in our neighborhood’s plan. So after our Candidate Forum in October, we are back to regular meeting business. This month we’ll hear about the Havana Street water main project, a new bike/ped trail along 44th, and we’ll be taking nominations for our 2015 neighborhood council officers. Hope to see you there! Here’s the agenda.